The county of Garrotxa boasts a magnificent collection of natural treasures and, without doubt, the jewel of the crown is the Garrotxa Volcanic Zone Natural Park. It is an immense landscape covering over 12,000 hectares, with over 40 volcanoes hidden amid the vegetation. This is a magical place to visit at any time of year thanks to the huge variety of colours that change with the seasons. 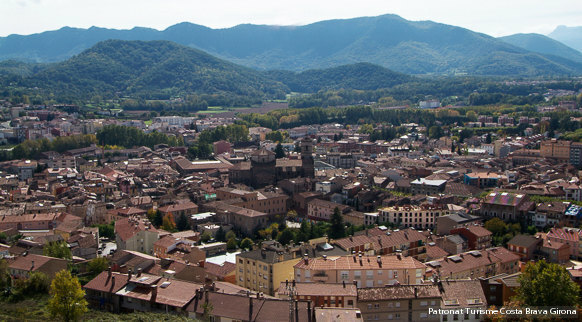 In Alta Garrotxa you can visit peaceful, beautiful high mountain towns such as Oix or Beuda, to name just two. The area has deservedly been declared an Area of Natural Interest and forms part of the Natura 2000 Network, a European initiative aimed at protecting outstanding natural areas and making the protection of natural habitats and species compatible with the human activity that goes on there. In the southern part of the county, the terrain becomes gentler but retains all of its charm thanks to the aforementioned volcanic zone, rural municipalities such as Les Preses and stunning natural landscapes such as that of the Bas valley. Make sure you visit Olot, the county capital, a dynamic, lively city with a rich cultural heritage. Meanwhile, there are plenty of charming little towns that feature in all the guidebooks, such as Castellfollit de la Roca, Santa Pau or Besalú.